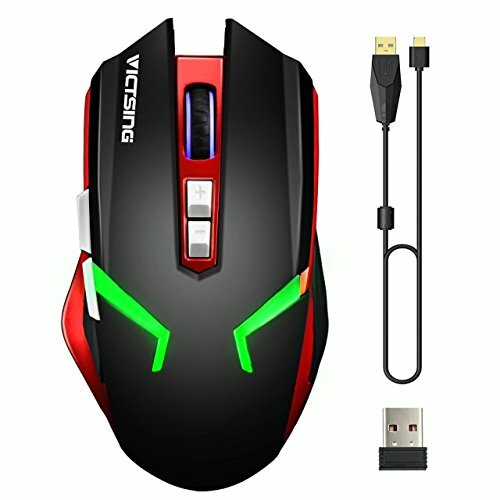 With the included USB receiver and USB cable, the professional gaming mouse can be used as wireless mouse and wired mouse as well. Meet different using habits. When being used in wired mode, the mouse is being charged as well. After a full charge, the mouse can work for up to 500 hours in wireless mode. The durable responsive click button can bear up to about 5 million times keystrokes. Moreover, the USB cable connector is gold-plated, resisting oxidation and corrosion for a long lifespan and stability. Plug and play. Insert the receiver into computer, or connect the mouse to computer via USB cable, the mouse will automatically turn on in the right mode. Adjustable professional 4 DPI levels: 800, 1200, 1600 and 2400. Perfectly control the mouse moving speed at your pleasure. The ergonomic design and skin-friendly material ensure the lasting comfort for your hand during the use. Perfectly Compatible with Windows 7/8/10/XP, Vista and Linux. Also compatible with Mac OS. 1. The mouse is battery-free. 2. Page up and down Button are not available in MAC. 3. Switch button for different power-saving is on the back of the mouse. DUAL MODES AND LONG BATTERY LIFE : Support dual ways connection--2.4GHz wireless connection and wired connection. You can enjoy movement freedom in the wireless mode via USB Receiver，its operation range is 10meter(32ft). When battery level is low or some high-precision operation needed, connect it to the computer through USB cable to get the battery charged and bring you perfect stability. Needs 4 hours for full charging, then it can provide a 500 hours standby time. 4 ADJUSTABLE DPI AND 4 COLORS BACKLIT: 800, 1200, 1600 and 2400 DPI resolution levels with 4 different colors backlit provide quick pointer moving and precise tracking. Convenient swift button make it easy to change DPI while gaming. Besides, incredible millisecond-level click response technology will give you great manipulation experience. Note:Backlit color will change according to the DPI level. ERGONOMIC DESIGN: Streamline-design mouse body and non-slip side will creat comfortable hand-feeling, minimizing your hand fatigue. Enjoy lasting comfort the mouse brings to you during gaming or working. RELIABLE QUALITITY: 5 million click tests ensure that it will suitable for game-level using. High-end optical engine support precise positioning and prevent from skipping frames, getting stuck and other undesirable phenomena. The 1.6M USB rubber cable and gold-plated connectors provide a stable transmission while charging the mouse. PERFECT COMPATIBILITY: The dual-mode gaming mouse is compatible with Windows 7/8/10/XP, Vista and Linux. It's also compatible with Mac OS, but the page up and down buttons are not available with Mac.